This eBook provides insights on how CAD in the Cloud offerings differ from traditional CAD applications. It also explores how such offerings improves the agility of engineering organizations, both small and large. Is it the Age of the Maker and Startup? What is CAD in the Cloud? Today, the leaders of many large engineering organizations are trying to figure out how to emulate the ability of startups and makers. Technology can be a critical enabler for such efforts. In particular, CAD in the Cloud offerings provides advantages in design exploration and iteration, collaboration with others as well as financial and technical flexibility. This eBook details each of those topics in detail. 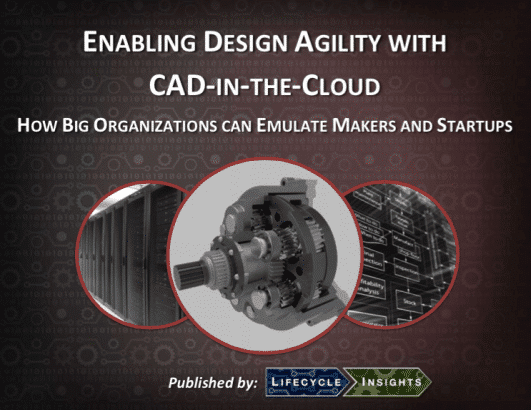 This eBook provides value to Engineering Directors and Managers seeking how to make their organizations more agile with technology, in particular with CAD in the Cloud offerings. Based on today’s headlines, you might think so. Based on unprecedented access to bleeding edge technologies, including cloud-based services and 3D printing, makers and startups are able to quickly explore and prototype new designs. It’s product development in the small, done on a dime. But it’s proven to be innovative as well as successful. Larger organizations, however, have a decidedly different reputation. With the need to coordinate far more employees, product development proceeds at a slower pace. Often with more established processes, it also seems to be bureaucratic. In contrast to makers and startups, larger organizations run product development in the large. Today, however, running a slow and bureaucratic development process won’t cut it, regardless of your organization’s size. Right now, we’re in the midst of significant changes to how products are developed and launched. They are coming to market in dramatically new and different ways. The barriers to entry are lower than ever. There is undeniable proof that innovation can happen anywhere. Some organizations see these changes as threats, with competitors finding new ways to disrupt a market. Others see them as opportunities to drive profitable growth. Either way, the imperative is the same: every organization must become more agile in product development. Of course, technology has an important part to play in this change. Computer Aided Design (CAD) software applications have been used by engineering organizations for decades now. For these tools, important advances have come in the form of Direct Modeling that allows users to push, pull and drag geometry as opposed to tweaking parameters and crafting feature-based models. While those advancements have been welcome, it simply hasn’t been enough, especially in the context of collaboration amongst distributed ad-hoc teams. Fortunately enough, the next major wave of innovation for CAD software is breaking on the industry. CAD software, offered as a service from the cloud, termed CAD in the Cloud, is ready to be used in production design, engineering and manufacturing environments. Explaining how these new CAD in the Cloud services work and impact today’s design challenges is the purpose of this eBook.